An Android app will execute in debug mode in the development environment, i.e. while running in the Android Studio Integrated Development Environment (IDE). The app will execute in release mode when installed from Google Play. In release mode any debug logging, StrictMode, and the debugging option must be disabled. When developing an Android app there are occasional times when detecting debug mode vs release mode is helpful. This article contains example code to show how debug mode and release mode can be determined at app runtime. It is possible to wrap calls to logging code, and StrictMode set up, in code that checks for debug mode. 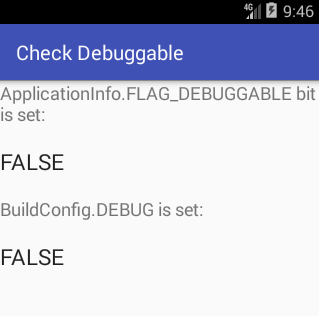 To detect Android debug vs release mode there are two objects that expose the debug flag, the ApplicationInfo class (since API Level 1) and BuildConfig (subsequent SDK releases). It's best to leave out the android:debuggable attribute from the manifest. 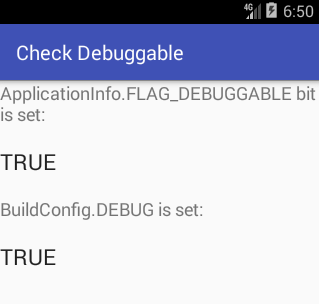 If you do, then the tools will automatically insert android:debuggable=true when building an APK to debug on an emulator or device. And when you perform a release build, such as Exporting APK, it will automatically set it to false. If on the other hand you specify a specific value in the manifest file, then the tools will always use it. This can lead to accidentally publishing your app with debug information. But developers on some forums now say that the android:debuggable attribute no longer works. Indeed, if set to a different value from the Gradle settings (see below) the project will not build. The class BuildConfig (generated at build time) allows for build specific settings. The flag BuildConfig.DEBUG is set true when the app is running in the IDE. 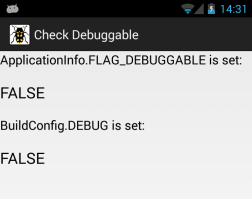 It is set false in the released APK, therefore BuildConfig.DEBUG mirrors the older android:debuggable value. To detect if code is running in debug test the BuildConfig.DEBUG for true. However, a word of warning. BuildConfig.DEBUG may not be correct if checked in code packaged in a library. See the other Android Studio example projects to learn Android app programming.